Syrlinks has been created in June 2011 by 4 managers of TES Electronic Solutions. Syrlinks is an independent SME with a capital of 1.000.000€ whose headquarter is located in Cesson-Sévigné (near Rennes, France). The activity of the company comes from the SOREP Company, created in 1978 and that became Thales Microelectronics in 2000 and then TES in December 2004. Its historical core activity already was to design, develop and produce components and radiofrequency and hyper frequency modules for spatial, defense and security applications. Nowdays to reply to the growth of new markets, Syrlinks had developed new product ranges. Its multidisciplinary R&D department and its laboratory facilities help it to take on complex projects and to reduce production times. - Satellite embedded communication products in low orbit: X band transmitter, transceiver telemetry/telecommand in S band, L band transmitter. Syrlinks solutions associate technology and reliability to aim at optimizing performance and the equipment integration level to be deployed in severe environments. 55 people work in this new structure. 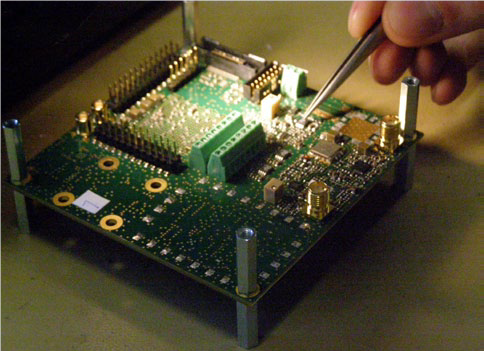 They cover all the necessary techniques needed for the development of spatial and defense products: quality, electronics, microelectronics, radio and hyper frequency, embedded software, numerical treatment of signal, mechanical. A laboratory of 350m² dedicated to the development of the equipment, their integration and then their production (in small series). Otherwise, Syrlinks has developed an ASIC for ultra-miniature distress beacons, and an ASIC for a temperature controlled quartz oscillator. Armed with an expertise in the Time/Frequency industry, Syrlinks has committed to the SCPTime® consortium in order to imagine and produce a micro atomic clock. A true time keeper into the security facet of the architecture of SCPTime®, this clock will guarantee the good functioning of the system in case of GNSS signal failure. To develop this clock, Syrlinks will associate its software and hardware embedded electronic engineers and its quality and mechanical engineers. Syrlinks will integrate in its design the subassembly of Tronics which is also an SCPTime® partner.